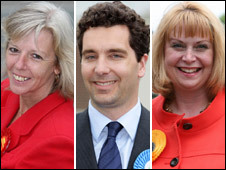 Senior MPs from the main parties are in Crewe and Nantwich in a final push for votes ahead of a key by-election. Labour deputy Harriet Harman, shadow home secretary David Davis and Lib Dem leader Nick Clegg are all in the area to support their respective candidates. The by-election was sparked by the death of Labour MP Gwyneth Dunwoody, who had held the seat since 1983. Several polls have suggested the Conservatives are on course for their first by-election gain since 1982. Bookmakers Ladbrokes announced on Tuesday they had stopped taking bets on the outcome saying the Conservatives have become "unbackable" at 16/1 on. Conservative leader David Cameron has pledged to "pull out all the stops" to secure the seat, which would be the party's first by-election gain from Labour in 30 years. He has urged Crewe and Nantwich voters to send Gordon Brown a message about the abolition of the 10p tax band and his performance since becoming prime minister last summer. 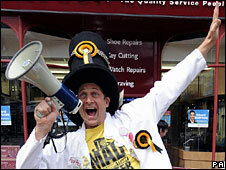 He and Liberal Democrat leader Nick Clegg have made several visits to the constituency, but the prime minister has not. At prime minister's questions earlier Mr Brown said it was traditional that prime ministers did not go to by-elections. Mr Cameron said replied that his predecessor Tony Blair had done so and asked: "Instead of leading from the front, hasn't the prime minister just put himself into his bunker?". Ms Harman and Environment Secretary Hilary Benn were in Cheshire, phone canvassing for the Labour candidate Tamsin Dunwoody. Labour have been accused of negative campaigning over literature accusing the Conservative candidate Edward Timpson - a barrister whose family founded the Timpson shoe repair business - of being a "toff". Their campaign promotes Ms Dunwoody, daughter of the late Gwyneth Dunwoody, as "one of us". Labour's chief whip Geoff Hoon told BBC 2's Newsnight, the party's campaign was about "choosing the best person to best represent the people of Crewe and Nantwich" and he said Ms Dunwoody was "an excellent candidate". But speaking to BBC Radio 4's World at One programme on Wednesday, Labour MP Louise Ellman, who is expected to take on Mrs Dunwoody's role as chairman of the Commons transport committee, said: "I think it was envisaged as something humorous but I feel more comfortable with a more positive campaign." Campaigning with Mr Timpson in Nantwich on Wednesday, shadow home secretary David Davis praised the late Mrs Dunwoody as a "best friend" whom he had once proposed for the role of Commons speaker. But he criticised the direction of Tamsin Dunwoody's campaign adding: "The fact that Labour are not talking about issues displays a sense of defeat." The Conservatives expect to have about 200 volunteers in the constituency on Thursday as part of a "get out the vote" drive. Lib Dem leader Mr Clegg is out with his party's candidate Elizabeth Shenton on Wednesday, talking to voters in Nantwich town centre. Liberal Democrat Cheadle MP Mark Hunter, who won his seat in a by-election in 2005, told the BBC on Wednesday the party's message was being "very well received" in Crewe. "Elizabeth Shenton is an excellent candidate, she's very well qualified for the job and we think there's a real momentum that's building in our favour and it could be a very close contest indeed come close of play tomorrow." Meanwhile Mike Nattrass, the UKIP candidate, was also handing out leaflets in Nantwich town square. He said: "UKIP has never stood in Crewe and Nantwich before because Gwyneth Dunwoody was Eurosceptic and we agreed with her." He said he hoped to raise the party's profile ahead of next year's European elections. At the 2005 general election, Gwyneth Dunwoody won the seat for Labour with a 7,078 majority. But a survey of 1,001 adults in Crewe and Nantwich by ComRes for the Independent, published on Tuesday, gave the Conservatives a 13 point lead on 48%, compared with Labour's 35% and the Lib Dems on 12%. Iain Watson on John Prescott's backing of Gordon Brown.